SC Judges’ Press Conference: A Dark Day Or A Beacon Of Light? Whether the press conference held by four learned judges of the Supreme Court of India will lead to the rise of the apex court or its downfall seems to be the question on everyone’s mind. Yesterday on the occasion of the birth anniversary of Swami Vivekananda, could it be that the four Hon’ble judges adopted his teaching of “Arise, awake and not stop till the goal is reached”. In what might be proposed in the future history of the Indian Judiciary as a tumultuous dark day, the press conference by the four judges has brought to the fore a great conflict. Is it a conflict of interest? Is it a conflict of personal accountability? Or, is it a conflict that should attract the attention and scrutiny of every citizen of this country? Whatever be the cause, the “unprecedented” move and incident has brought into focus, once more, the current misgivings in the working of the apex court. While “unprecedented” is the de-facto word being shouted in every media in relation to the press conference, the supreme question must not lose its lustre. WHY? Have four, amongst the most revered pillars of justice in the country, aired their dirty laundry in front of the entire world? Have the cardinals of the Indian Judiciary defiled their office by voicing their concerns to the people of this country directly through the media? Even in time of such great conflict, the four, who have spent majority of their careers meticulously penning down orders in detail, have held up the dignity and honour of their office and institution by speaking less on the public forum and yet addressing the entire nation and telling it more than their words have portrayed. One only needs to read between the lines. While the issue raised of listing and allotment of cases by the CJI, ‘the master of roster’, might at first glance, seem like an inter-personnel conflict, it is, in its true nature a beacon of conflict of interest; a conflict of interest on part of the Chief Justice of India. The manner in which the CJI in dispatching duty as the master of roster to allocate is under attack. It is the grave concern of the four judges that crucial cases where the judgments can have far reaching ramifications or can alter the course of the nation, are being handed to junior judges with limited exposure. Whether such assignment of cases to a selected few judges would result in outcomes favourable to the incumbent government also seems to be amongst the concerns expressed by them. Such subversion of principles and long-lasting traditions of the apex court by the CJI is not only questionable, but it may also result in the enslavement of the judiciary by the government. Hence, no matter the forum chosen by the four, the cause highlighting therein of such enslavement is at par with the principles of maintaining the freedom of the judiciary. 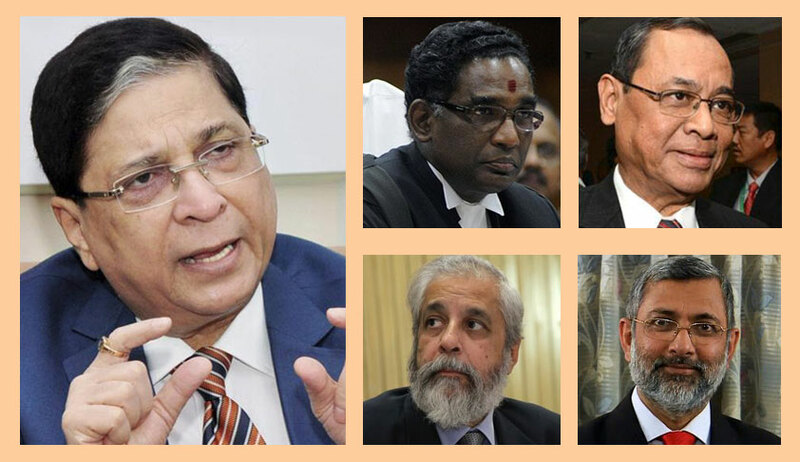 The four could have easily embarrassed and unravelled the Indian Judiciary System, and especially the CJI, by citing specific incidents but have refrained from doing so and, hence, their motives cannot be addressed as having some kind of malice. Justice Chelameswar, who has already voiced his concern over the opacity of the collegium system, could have easily usurped the opportunity to set in motion the impeachment of the CJI, but has made no such move. Hence the intentions of any of the Ld. judges cannot be doubted or misconstrued. Something ‘out of order’ is not necessarily ‘in chaos’, but can very easily slip into one without timely intervention. The four tried to intervene by addressing the centre of the disorder and could have gone through the proper ‘bureaucratic’ channels to remedy the issues at hand. However, had we only fought through the bureaucratic channels of Mahatma Gandhi and not had revolutionaries like Bhagat Singh, would we have really attained Independence? In Bhagat Singh’s own words, “If the deaf are to hear, the sound has to be very loud”. It might seem like an overreach to compare the two scenarios but let us not forget the essence of the institution we are talking about. The main objective of the apex court is to protect the fundamental rights of the citizens and to uphold the Constitution. The people at the centre of the issue, the four ‘dissenters’ or ‘rebels’ as they will be addressed in the coming days, are not only attacking the CJI for his subversion of powers but are bringing to the fore the alleged meddling of the incumbent government in the judiciary and its subsequent enslavement. Let us also not forget that these are four learned senior judges of the temple of justice we regard as the highest in our nation. Before raising their concerns before the media and the public at large, they have surely done their due diligence and have already thought of the repercussions and yet, we are at this juncture. ‘Unprecedented’ is going to be the buzzword, but isn’t the Supreme Court of India always setting new precedents? Only here, the four are trying to avoid a dangerous precedent being set; one that diverges from the enshrined principles of the apex institution and seems to benefit those in power. This, in my personal opinion, should not and would not amount to sensationalising an internal conflict before the general and cannot and should not be termed airing you dirty laundry in public. Will their courageous/ audacious act cast a shadow on the Indian Judiciary or will it fire up a beacon whose light can bring transparency to the entire process of the law. The law is and must be equal for everyone and not selective based on certain factors. So, is their act in accordance with protecting the fundamental rights of the people and upholding the Constitution or is it really on a wholly untenable footing. Only time can tell. Without saying it, have they reassured the people that one should fear the law and not the one passing the judgment? Law is flawless, the one judging it might not be. If someone is subverting the law, no matter who they are, they are open to criticism and scrutiny; and that should be the key takeaway. Rajesh Inamdar is an Advocate at Supreme Court of India.